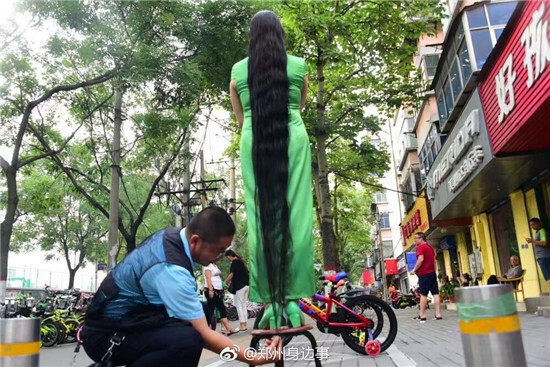 A woman in Zhengzhou, Central China's Henan province tends to draw crowds when she goes out in public due to her 1.93-meter-long hair. Fan Lili stands on a stool showing that her hair exceeds her height, Zhengzhou, Henan province, on July 30, 2017. Fan Lili, 49 years old, living in Zhengzhou, said that she stopped cutting her hair 25 years ago. "My mother said my hair has good quality and she would like me to keep it, and other family members also agreed," Fan said. The long hair has brought joy to her life. When she goes in public, many people admire her hair and chat with her. Some men even pursue her, though her husband is not so happy about that. Maintaining her long hair also creates problems, such as washing. Fan said that she has to take a shower for about one and a half hours in order to wash her hair, using about 200 millimeters of shampoo every time. She can't use common chemical shampoos, only natural. Drying is another thing. Fan does not use a hair drier but leaves her hair to dry naturally. The catch is it takes about two days to dry. When going out in the day, Fan has to put up her hair, and releases it at night to put by the bedside to sleep. An 80-year-old man surnamed Feng said that it was the first time he's met a person with such long hair in Zhengzhou, and another old man even questioned that her hair was fake. "I will keep the hair to see if will grow a s long as twice my height," Fan said. A Chinese woman tends to draw crowds when she goes out in public due to her 1.93-meter-long hair.